I have this 40 GB volume (partition) that I would like to extend to 80 GB. I have already shrinken (downsized) the system partition in order to create some unallocated space before the partition that I want to make bigger. 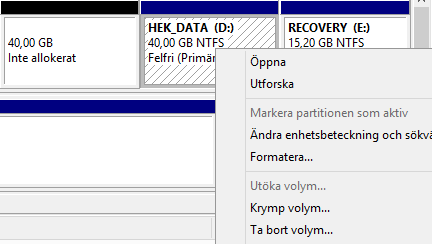 The problem is when I right click on the 40 GB partition I can't select the "Extend volume" option. Why not? You can see by the screenshot above that the space before my partition is "RAW". That's because I formatted selecting any file system. But it was black before, indicating "unallocated" space, and I still couldn't extend my partition to include this space. In the screenshot above you can see how it looks like with unallocated space before my partition. 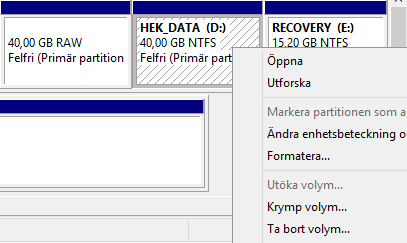 I obviously can't just remove my RECOVERY partition that sits right after my partition. I won't be able to restore the computer ever again. So that's not an option. The way that Windows does it's partitioning, you can only extend volumes forward, because the RAW space is technically behind the volume, it can not expand out backwards. You would need to use some 3rd party tool, or expand the C:\ to take up the space allocated to it. It's just the way Windows operates. Booting from an external media, such as USB or CD/DVD will allow you to modify the HDD partitions and write the changes that you want to use. Not the answer you're looking for? Browse other questions tagged windows-8 hard-drive partitioning or ask your own question. How to extend hard disk partition backwards (to the left) without third-party tools?